My kids and I are hooked on watching The Pioneer Woman on the Food Network. I’ve got several of her cookbooks and browse her website often. It was during one of these browsing sessions that I discovered the Salisbury Steak Meatballs recipe. 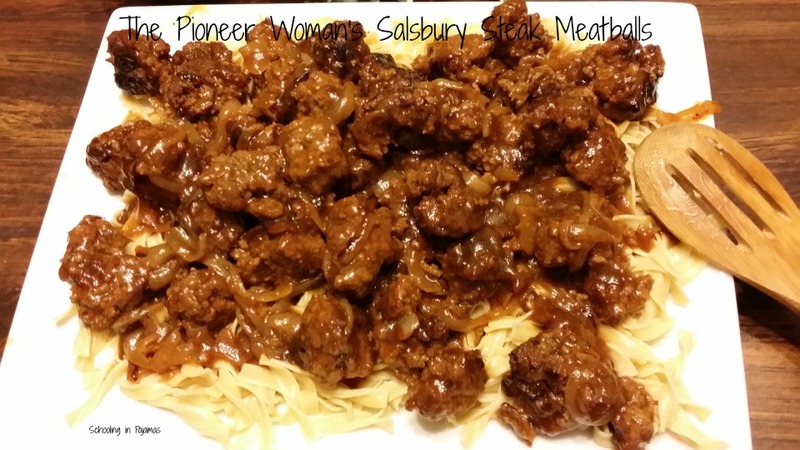 I just knew I had to try this recipe as we all are meatball lovers and all but one of my crew love Salisbury Steak when I fix it. Here’s the website for the original recipe. To make the meatballs, combine the first 8 ingredients in a mixing bowl and knead until completely combined. 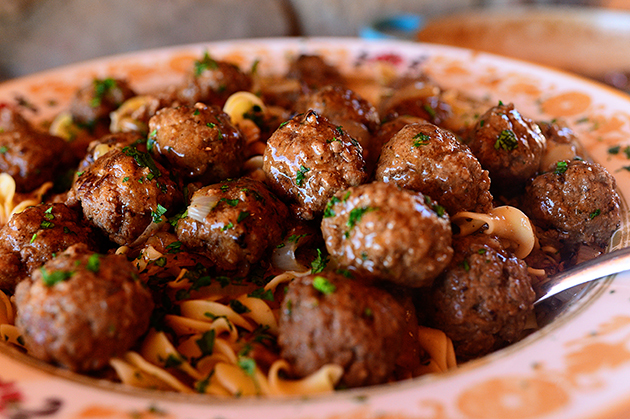 Form into medium-sized meatballs and place on a plate. Heat a large skillet or dutch oven over medium heat, and then add 2 tablespoons of Land O Lakes® Butter. When melted, add half the meatballs and gently move around the pan to brown. When brown, remove them to a clean plate and repeat with the rest of the meatballs. In the same skillet, add the onions and cook for 3-4 minutes, until golden brown and starting to soften. In a small bowl, mix ½ cup of beef broth with the cornstarch. Next add to the skillet 2 cups of the beef broth, Worcestershire sauce, ketchup, and mustard. Stir to scrape the bits off the bottom of the pan. Bring to a gentle boil and add the cornstarch mixture. Return the meatballs to the pan, reduce the heat to low, and allow them to simmer in the sauce for 10 minutes or until meatballs are done and sauce is thick. (Splash in more beef broth if needed for thinning.) To give the sauce a deeper color, add a little Kitchen Bouquet. Serve meatballs and sauce over a platter of egg noodles, tossed in the remaining 2 tablespoons of Land O Lakes® Butter and sprinkle with minced parsley. Recipe note: Sauce should be thick and glossy! Disclosure: This recipe sponsored by Land O’ Lakes. So my meatballs didn’t exactly come out round like regular meatballs but the dish came out extremely well. The only thing I left out was the optional Kitchen Bouquet. The first few times we had it with egg noodles. We substituted the noodles with mashed potatoes and it was awesome that way. prep:*** Three stars because it is a bit involved due to making the meatballs but other than that it is not bad time wise. taste:**** Four stars because it taste good. All my kids except the picky eater loved it. The best test is what my husband thinks and it he asked for it again. add to menu: ***** Five stars because we did add it to the menu and have had it several times already.